To meet rising consumer demand for the award-winning 2.0-liter EcoBoost® engine, Ford Motor Company will invest nearly $200 million and add 450 new jobs at its Cleveland Engine Plant. Production of the 2.0-liter EcoBoost for North America is currently based in Valencia, Spain. The investment in Cleveland will shift North American production to Ohio, while Ford’s Valencia Engine Plant will remain the exclusive production location of the 2.0-liter EcoBoost for Ford of Europe-built vehicles. Valencia will continue to produce and ship parts for these engines to North America. Overall employment at the Valencia plant will not be impacted. The Valencia Engine Plant will transfer some employees to Valencia Assembly Plant to support increased production for C-MAX, Kuga, Transit Connect and Tourneo Connect. Ford is making the move to assemble engines regionally to help meet rising consumer demand for the award-winning 2.0-liter EcoBoost and to optimize production capabilities around the world. Production of the 2.0-liter EcoBoost engine will begin in North America in late 2014. 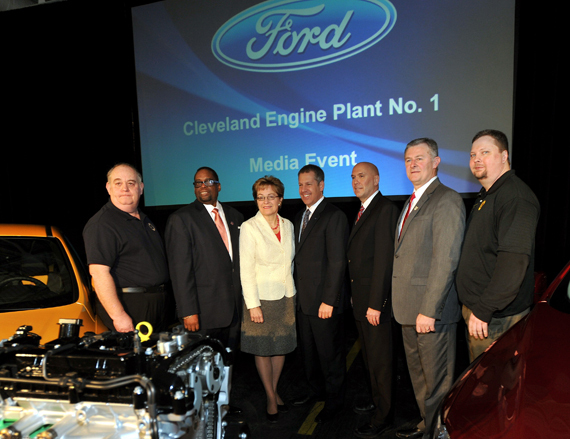 Cleveland Engine Plant currently builds the 3.5-liter EcoBoost engine and 3.7-liter V6. The Ohio facility employs approximately 1,300 people. It has built more than 500,000 3.5-liter EcoBoost engines since 2009. EcoBoost is the cornerstone of Ford’s global engine strategy to reduce fuel consumption and emissions. Ford will expand EcoBoost production to 1.6 million engines this year – nearly 100,000 above the previous target. Delivering up to 20 percent better fuel economy than larger-displacement engines, EcoBoost uses smaller overall size combined with turbocharging, gasoline direct injection and variable valve timing to bring customers outstanding performance without sacrificing fuel economy. This year EcoBoost will be available on more than 90 percent of North American nameplates and by 2015, 95 percent of Ford nameplates will be available with EcoBoost engine technology. In 2013 Ford expects to sell more than 500,000 EcoBoost-equipped vehicles in the U.S. – a sizeable increase over the 334,364 EcoBoost vehicles sold in 2012. The 2.0-liter EcoBoost engine to be built in Cleveland is currently available in the Ford Explorer, Edge, all-new Escape and all-new Fusion, Focus ST, Taurus and new Lincoln MKZ and MKT Livery. The engine has won a coveted Ward’s 10 Best Engines trophy each year it has been available in North America.